Entertainment + Culture Advisors (ECA) provides an overview of recent development trends in Asia Pacific region, leading theme park attractions players, development of attraction/theme park hubs as well as branding/IPs in Asian project and industry outlook. It should be noted for full disclosure that ECA has provided strategy advisory and feasibility for several of the projects including Universal Studios Beijing, LEGOLAND Parks/Merlin Midway Attractions, Village Roadshow, Wanda Group, Huayi Bros. (HB) and Themed Attractions/Khazanah, and KidZania. With this base, projects are moving forward faster in Asia than anywhere else in the world. That speed and propensity for development is attracting strong developer interest and a broad range of new investment, not only for theme parks, water parks and destination resorts, but also indoor location-based entertainment (LBE) attractions, in particular with a focus on large scale destinations and integrated resorts (IRs). The development of theme parks and attractions around the world has followed a typical product life cycle curve of market growth followed by stabilization and then reinvestment to diversify. Developers responded to the maturation and saturation of the North American market by pursuing international opportunities, starting with the opening of Tokyo Disneyland (TDL) in Japan in 1983. The industry has continued to thrive and mature in Japan since the opening of TDL. It has since expanded to Korea, Singapore, Malaysia, and now China. The emerging middle class in India, one of the largest populations in the world, will also provide future opportunities. Walt Disney Parks & Resorts – the leading global theme park operator with two existing theme parks in Asia (Tokyo Disneyland Resort, owned and operated by Oriental Land Co./OLC with license from the Walt Disney Company, and Hong Kong Disneyland via Hong Kong International Theme Parks Ltd.) and one pipeline project Shanghai Disney Resort in China, a US$5.5 billion joint venture with Shanghai Shendi Group (a Chinese state-owned company) opening in spring 2016. Universal Parks & Resorts (UPR) – current locations in Asia include Universal Studios Japan (USJ) in Osaka (owned and operated by USJ Co., Ltd. with a license from NBCUniversal) and Universal Studios Singapore within Resorts World Sentosa (owned by the Malaysian Genting Group). Universal Studios Beijing, a joint venture between Beijing Shouhuan Cultural Tourism Investment Co. Ltd. (a consortium of four Chinese state-owned companies) was recently approved and expected to open in 2019+ with an estimated initial US$3.3 billion capital investment. Merlin Entertainments Group – second largest visitor attraction operator in the world – develops and operates branded family resort theme parks, LEGOLAND Parks, Midway Attractions, such as Madame Tussauds, LEGOLAND Discovery Center (LDC), SEA Life Aquarium, and The Dungeons. Current portfolio in Asia includes LEGOLAND Malaysia; Madame Tussauds in Hong Kong, Shanghai, Beijing, Wuhan, Tokyo and Bangkok; SEA Life in Busan, Seoul and Bangkok; and LDC in Tokyo. Strong pipeline in Asia including LEGOLAND Japan (2017), LEGOLAND South Korea (2018) and multiple Midway Attractions in Asia/China. –Ocean Paradise theme park under construction in partnership with leading Chinese developer R&F Group in Lingshui, Sanya, Hainan Island, expected to be operational in 2016. –In March 2015, signed an agreement to establish a funds management business with CITIC Trust Co. Ltd., one of China’s largest investment banks, for the purpose of investing in theme parks, entertainment facilities, and related real estate development throughout Asia, with a focus on China. –Working with Sunway Group for major theme park development in Southern Malaysia (Johor). –Letter of intent with SeaWorld Parks and Entertainment to co-develop potential theme park opportunities in China, Southeast Asia, India, and Russia. Shenzhen Overseas Chinese Town Co. Ltd. (OCT) – Pioneer in China’s regional theme park industry since 1989; developer and operator of 10 theme parks including Happy Valley and Mayaplay water park, Windows of World, Splendid China/Chinese Folk Culture Village, OCT East, OCT Bay Happy Coast with indoor aquarium, MyRules children attraction and nighttime water show located in Shenzhen, Changsha, Beijing, Shanghai, Chengdu, Wuhan and Tianjin. Upcoming pipeline theme park projects include Liuzhou in Guangxi, Chongqing, and other cities as well as expansion of existing parks in Shanghai and Beijing. Guangdong Chimelong Group – Top Chinese theme park developer and operator based in Guangdong Province of two large scale tourism destination resorts with multiple-gated attractions in Guangzhou (Chimelong Paradise Theme Park, Water Park and Safari Park) and Zhuhai/Hengqin Island (Chimelong Ocean Kingdom). Wanda Group – Wanda Group is planning 10+ major Cultural Tourism Cities throughout China in the next 5-7 years, including Hefei (2016+), Nanchang (2016+), Harbin (2018+) and Wuxi (2019+), Guangzhou among others. Pipeline Development: Wanda Group is planning 10+ major Cultural Tourism Cities throughout China in the next 5-7 years, including Hefei (2016+), Nanchang (2016+), Harbin (2018+) and Wuxi (2019+) and Guangzhou. Haichang Group – Owns 6 polar marine themed parks, an aquarium as well as a water park in China with very limited theming and IP licensing. Pipeline include a flagship marine theme park in Shanghai as part of a larger 74-acre site with themed resort hotel and commercial facilities targeted to open by end of 2017 as well as Sanya Haitang Bay Dream World destination development to open 2017+. Songcheng Group – Hangzhou-based developer and operator of Songcheng Cultural Theme Park, Hangzhou Paradise, an indoor children’s amusement park Crazy Apple Land, a water park, several resorts; also well known for its series of “The Legend of Romance” performance shows. Ocean Park (HK) – owns and operates Ocean Park marine theme park in Hong Kong, a home-grown and globally recognized marine theme park operated as not-for-profit organization. The park underwent a US$712 million redevelopment plan between 2006 and 2012 as part of an eight-phased expansion masterplan. Ocean Park is continuing to expand with a planned water park to be open in 2nd half of 2017. The phase 2 expansion will help transform Ocean Park into a multi-day destination. Lotte Group – developer of Lotte World, a major recreation complex in central Seoul including an indoor theme park and an outdoor amusement area. Genting Group – developer and operator of Genting Highlands (under redevelopment to become a US$500+ million 20th Century Fox World Theme Park set to open in 2016), Resorts World Sentosa including Universal Singapore (operated by UPR). Genting also recently broke ground on large-scale Chinese themed integrated resort (IR) in Las Vegas which may include several attractions including indoor waterpark and Panda exhibit. SEGA (Japan) – developer and operator for Joypolis, SEGA Republic (with Emaar Retail) and SEGA-BBC Orbi science and educational attractions. HK Disneyland opened in 2005 and based on recent significant new capex and reinvestment into the park is making a turn-around and increasing attendance levels. Everyone is focused on the opening of Shanghai Disney in spring 2016 as the watershed event in the Chinese theme park industry. We expect Shanghai Disney to have a highly positive impact on the Chinese market in several ways: industry expansion – ‘complementary effect’; market education and awareness; price and product leadership; product positioning and increasing standards at other parks/industry; development environment; and service standards and industry expertise. There are several major theme park projects in the planning stages or proposed in China with international operators/partners. Notably, the Ocean Paradise Marine Theme Park in Lingshui near Sanya in Hainan Island by R+F Group and with Village Roadshow as professional operator. This will be Hainan Island’s first large-scale major commercial theme park. Theme parks and tourist attractions have a complementary effect on each other as more tourism product spurs growth and additional investment in the industry and leads to better attractions. High quality destination theme parks often become the main anchor for domestic and international tourism. Over time, markets can grow to accommodate multiple theme parks, becoming multi-theme park destination hubs. The most established examples of hubs with multiple gates (parks) are Los Angeles/Southern California and Orlando/Central Florida in the United States and the Gold Coast in Australia. Tokyo – two mega Disney parks: Tokyo Disneyland and Tokyo DisneySea; OLC recently announced a JPY500 billion expansion plan for the Tokyo Disney Resort over the next 10 years. Greater Seoul region – two major parks: Everland and Lotte World; LEGOLAND Korea in planning stage. Several large scale integrated resorts (IRs) under development around Incheon Airport which may also include large scale indoor attractions and theme parks. –Yangtze River Delta (YRD) in three main areas – Shanghai, Suzhou- Wuxi-Changzhou and Hangzhou. Village Roadshow and Guangzhou-based real estate developer R&F Properties partnered to develop a RMB 3.5 billion theme park destination resort in Lingshui, near the popular resort city Sanya, in southern Hainan Island. The theme park, Hainan R&F Ocean Paradise, will have a focus on marine life, similar to Village Roadshow’s existing Sea World theme park in Gold Coast, Australia. There are also plans for a branded Wet’n’Wild waterpark as a second gate. Village Roadshow will have the exclusive rights to operate both parks, due to open in 2016, for the next 20 years. Walt Disney will bring the sixth Disney theme park destination, the first in Mainland China, to Shanghai with an expected opening in 2016 in the Pudong New Area. A new metro line will be built for the project. The first phase is reported to cover 4 sq. km, about half of Disney’s property, with future plans to expand the resort to include 3 theme park attractions. Shanghai Disneyland will be a part of the larger US$5.5 billion first-phase Shanghai Disney Resort development, featuring a large artificial lake, two hotels (1,220 rooms), a conference center, retail and leisure facilities (46,000 sq.m.). The reported investment is US$4.8 billion for the theme park and $700 million for hotels, RDE, other. Government officials are projecting annual attendance in the 10+/- million range for the first year. Fox Movie World Genting Highlands, Kuala Lumpur – the 25-acre park being developed at an estimated cost of US$500+ million) will feature 6 themed zones with over 25 rides and attractions of Fox IPs, such as Alien vs Predator, Ice Age, Planet of the Apes – slated to open in 2016. LEGOLAND – several parks currently in development/planning in Asia/China including Nagoya, Japan (2017), Korea (2018) and China (2020). Comcast Corporation, parent company of Universal Parks & Resorts (UPR), has announced plans to team up with Beijing Shouhuan Cultural Tourism Development Co. (BSH, state-owned capital background) to jointly develop a Universal theme park in Tongzhou district, Beijing with an investment of RMB20+ billion (US$3.3 billion). 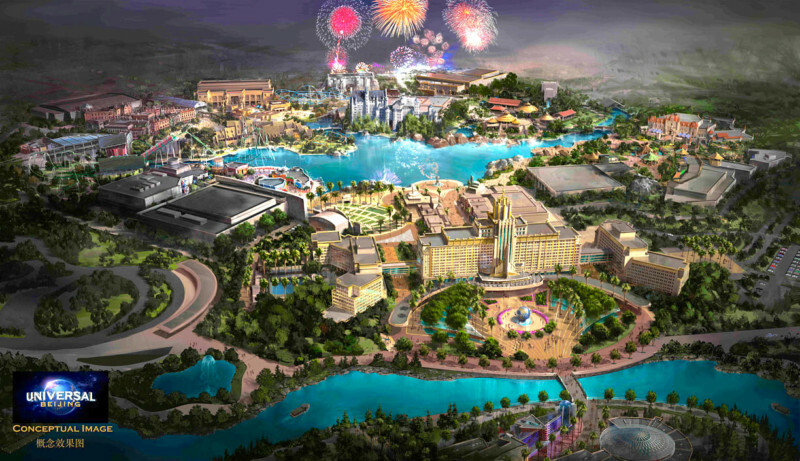 The 120 hectares theme park destination resort, which will eventually expand to 400 hectares, will include unique attractions and experiences specifically designed for the Beijing park, a Universal CityWalk retail, dining and entertainment (RDE) complex, and the ‘first-ever’ Universal themed hotel, targeted to open in 2019. The concept design will be inspired by a combination of major blockbuster movie themes and China’s cultural legacy and could include “Transformers”, “Despicable Me” and “Harry Potter” themed land attractions/rides based on the films’ popularity in China and others. Theme parks in Asia have many similar features and components to those in North America and Europe. Key differences are adaptation of local/regional Asian cultural stories and legends in some parks. Chinese parks are designed for larger crowds in public areas due to holidays and peaks during the three major Golden Weeks. 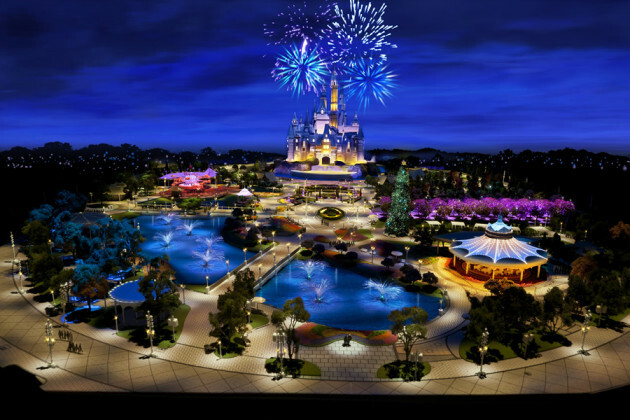 Chinese parks also focus more on cultural shows, festivals and parades – spectacular night-time shows are very popular. F&B offerings are based on local tastes and customs to fit the market with some selected international brands. HK Disney has its own full range of IPs and brands – Shanghai Disney will further extend and complement this in Mainland China. Most international IP holders and brands are actively looking at China and selected markets in Asia and very interested in entering the Asia Pacific region. This includes most major movie-film studios and attraction operators such as Universal Studios, Merlin Entertainments/LEGOLAND, 20th Century Fox, DreamWorks, Paramount Studios and other brands/IPs (Hello Kitty/Sanrio, HiT Entertainment, Sesame Workshop, Cartoon Network, KidZania). In China, Huayi Brothers Movie World in Suzhou will incorporate its own Chinese movie IPs into its movie-based theme park attractions and experiences. Wanda Group is developing its own parks based on Chinese local, regional and national stories, legends and cultural factors. Universal Studios Japan (USJ) has been successful with incorporating ‘Cool Japan’ popular manga/anime/video game attractions into the theme park on a seasonal basis such as Evangelion, Attack on Titan, Biohazard, Monster Hunter (from January to May 2015). The additions drew an estimated 200,000 incremental visitors per month. The One Piece attraction at the Tokyo Tower based around the popular Japanese manga and anime series One Piece. Nintendo/Universal Studios recently announced plans to bring the world of Nintendo to life at Universal theme parks – creating spectacular, dedicated experiences based on Nintendo’s wildly popular games, characters and worlds. Represents a significant partnership for Nintendo as it expands the reach and popularity of its characters and intellectual property. As highlighted earlier, ECA sees strong growth potential for the region and expects China and Asia to lead the future growth of the industry. China has major development potential in terms of new investment, attendance and pricing/revenues as income levels rise leading to increased interest/demand in entertainment and tourism – expanding to 2nd-tier and 3rd-tier cities and beyond. There is also strong interest by major international operators/brands/IPs as well as local developers. The opening of Shanghai Disney Resort and Universal Studios Beijing will be watershed events, raising quality, pricing, market awareness and service levels. Integrated destination development will become the model for future development with diverse entertainment and hospitality program elements, including theme parks, other attraction gates, hotels, RDE, and other mixed-use commercial. The emergence of multi-theme park hubs will continue in the PRD, YRD, Beijing and Southern Malaysia/Singapore regions as well as a diversification of formats with new indoor attraction-anchored urban mixed use/retail development projects. Assuming a current urban population of 600 million and total estimated 100 million annual theme park attendance, theme parks visits per capita is currently <0.2. Compared to U.S. theme park industry with an estimated 290-300 million attendance (IAAPA), China still has some significant catching up to do (growth) to reach U.S. levels of per capita theme park visitation. With China’s vast population size alone (3.5-4 times of U.S. and EU) the growth potential of new parks and attractions is significant.